HEARTBREAK In Favreau's follow-up, the iron guy has ticker troubles but love's got nothing to do with it. You forget these days that an incredibly few years ago the star of the smash Sherlock Holmes and Iron Man franchises was a Lindsay Lohan-grade punchline, a drug casualty waking up in the homes of complete strangers and, ultimately, in the big house rocking an orange jumpsuit. That is, you forget until the beginning of Iron Man 2, when Tony Stark descends like some glittering god to the Vegas-style stage of the Stark Expo and informs an adoring throng that “Never has a greater phoenix metaphor been personified in human history.” His character is, of course, alluding to something else — I never did grasp what — but Robert Downey Jr. might as well have been reciting the opening lines of his autobiography. His really is a remarkable story. Iron Man 2? Not so much. Though it is good for a few laughs, lots of explosions and almost as many bad guys. It’s worth seeing to the extent that Downey is at the center of the mashed-up mayhem, and nobody can hold a candle to the actor when it comes to smartass patter. This is not one of those sequels which, to the astonishment of audiences and critics, improves on the original. Jon Favreau’s follow-up to his 2008 blockbuster, on the contrary, suffers from a fairly classic case of sophomore slump. The picture’s afflicted with the cinematic equivalent of ADHD. As scripted by Tropic Thunder scribe Justin Theroux, it’s all over the place, starting new story lines before finishing others and switching focus from one character to another without allowing time for any to develop more than a single dimension. We open in New York with the spectacle of the Stark Expo, a sort of World’s Fair for tech heads. Minutes later, we find ourselves in Washington, D.C., where the billionaire bad boy rebuffs attempts by the Senate Armed Services Committee to force him to surrender the Iron Man suit to the military. Just as I was beginning to wrap my head around the point of the Expo, I found myself watching Stark drive a vintage race car at the Grand Prix in Monte Carlo. Thank God Mickey Rourke appears from nowhere covered with Russian prison tattoos and wearing a jerry-rigged getup that transforms his arms into 15-foot-long electric whips capable of slicing cars in half — or, I have no doubt, the film would have transported us in a matter of seconds to the Sydney Opera House to watch Don Giovanni. With his metal teeth and vodka-sipping cockatoo, Rourke’s Ivan Vanko is the most entertaining foe the film throws at the iron guy. But, because it throws so many, he gets far less screen time than he merits. Nowhere near as much fun are Garry Shandling as a lawmaker who wants our hero prosecuted for crimes against the state, Sam Rockwell as a rival arms manufacturer, Don Cheadle as a best friend who turns on Stark, Scarlett Johansson as a mysterious martial arts expert called Black Widow in the Marvel comics, and Samuel L. Jackson as her eye-patch-sporting boss — not to mention a virtual army of deadly giant drones. As if all that weren’t enough to kill the man in the can’s buzz, his high-tech heart is turning on him, too, leaching toxic material that will reach lethal levels if not replaced with a new energy source. How’s a wisecracking superhero supposed to deal with all that and woo Pepper Potts (Gwyneth Paltrow), too? 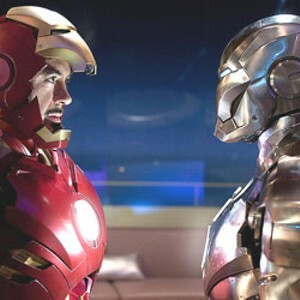 Hit and miss, overpopulated, plodding in places, filled with fight scenes and effects that can seem disconcertingly familiar, the second Iron Man comes off as less an action adventure than a testimonial to the value of time management skills. Downey cuts through the clutter on occasion and reminds us why we liked the first so much. But Favreau throws in everything but the kitchen sink in his desperate effort to meet stratospheric expectations, and the result is too much of a so-so thing.